Wendi responds to a question from a list member about which Year 7 books a new-to-homeschooling student might read over the summer in preparation for Year 8. Wendi: I'm going to include most of the year 7 list in my post and just add my comments after each title, explaining why that title was chosen. I'll also designate which titles I think are especially foundational to year 8. Wendi's comments: Obviously, while all our suggestions are merely recommendations and parents are expected to make the final decisions, this is doubly or triply true for Bible. I will just say that if a youngster has not had much experience with reading the Bible, the above arrangement seems to me particularly well suited for introductory reading- John and Luke are great companion gospels, particularly, I think, for gentiles, since Luke was especially written for the non-Jewish reader. Matthew, Mark, and Luke are known as the synoptic gospels, meaning their accounts very much parallel each other. John takes a different approach altogether, seeming to me to focus more on the philosophical underpinnings of the gospel story, the deeper theological questions (not that the others don't address these issues, it's just that John does it more)- So if you were only going to be able to read two gospel accounts, I'd suggest John and one of the other three gospels for the fuller treatment (unless you were Jewish, then I'd suggest Matthew and John specifically, and for younger readers, Mark, because he is more direct). Luke wrote Luke and Acts both to the same person, and so they are good companion books, foundational to understanding the rest of the New Testament as Acts is the account of the doings, teachings, practices and personalities of the first century church. Wendi: What my own children/students did in year 7 is read through the chronological Bible by F. LaGuard Smith, focusing on the gospels and early church. Smith introduces each section with a very small amount of commentary, primarily giving the setting and circumstances of the reading to come, with an occasional thoughtful question or comment. The Birth of Britain by Winston Churchill, which is Volume 1 of his 4 volume set, The History of the English Speaking Peoples. * Bede's Ecclesiastical History of the English People - Selections. Wendi: All of the above were included primarily to give some solid sense of the flavor and thought of the time. They are all early chronicles, a la CM. The Battle of Hastings was a pivotal event in English (and our own) history, but Malmesbury isn't the only way to get this (there is a lovely picture book by C. Hodges that I used with my younger children). I love Malmesbury. He is a great historian, one of the best of the best of the early chroniclers, very careful in his historical standards, and rich in his prose. I would have used more of his work if more of it were online- But, if you are crunched for time, I think all of these could be skipped although it makes me weep. Wendi: Foundational, in my opinion. Not reading this would be like studying American history without reading the Declaration of Independence. Wendi: included for more local color--a sense of the thoughts, ideas, attitudes of the time. You don't know the middle ages without knowing something of the Crusades, but you can get that elsewhere, so you could omit this if necessary. Wendi: Must read. It's fiction, but embedded in the fiction is a lot of good information about Richard III, and more importantly, excellent messages on how history is transmitted to us, why some healthy skepticism or an open mind is necessary, how viewpoint changes the history we are transmitted, very applicable to many life areas. That said, you could get this from reading Daughter of Time at any point. It's not necessary as background for year 8 specifically, so if you were trying to squeeze things into the summer, this could wait until the summer after year 8, or be added to year 8, or done later. But you really don't want to miss it altogether. Wendi: I would hate to miss either of these. I do not think a student can ever know too much about King Alfred, one of the greatest men of all time, in my opinion. Admirable, admirable man--and we need to put our students in touch with worthy, admirable leaders. The account by Asser as the advantage of serving dual duty--it's by a contemporary, so students will get a sense of the thought and writings of the time. Wendi: These are both great books. The Brendan Voyage is an exciting tale of Severin's attempt to recreate the legendary journey of medieval St. Brendan in Ireland. Will appeal to both boys and girls. If it weren't the occasional language and bawdy detail, I would have added How the Irish Saved Civilization as a companion read to this one, and some parents may still wish to do that. Heather - a lovely story of one family's visit to England to see all the places related to some of their best loved children's books, and will be especially meaningful to those who have read those books (most of them already included in AO's lower years). However lovely and worthy these books, neither of them could be strictly said to be absolutely foundational to year 8 and above, so if particularly crunched for time, you could skip them, although my fingers are reluctant to type such heresy. Wendi: You. Must. Read. This. Book. 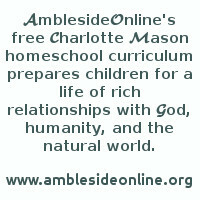 Plutarch's Lives - follow the schedule posted at AmblesideOnline. Wendi: Must reads, however, you needn't 'catch up' if you're starting later. Simply begin Plutarch wherever we are and continue, and begin Ourselves at the beginning and work through it at the pace that works best for your family. * Watership Down by Richard Adams. Wendi: Neither of these are precisely foundational for understanding year 8, but you really, really, really, want your student to read them at some point, and soon. Wendi: I suppose if crunched for time, one could simply begin year 8 at chapter 32. Wendi: Foundational in a broader sense- not necessarily a must read for understanding year 8, but there will be references and allusions to the stories in these pages all your students' lives, so they ought to know them from somewhere, and this is one good source. Wendi: Well, really your student ought to have met Chaucer, although Chaucer isn't well behaved enough, in my opinion, for the meeting to be unchaperoned. Check your library, you might have another good introduction if you don't wish to buy this one. Do pre-read. Wendi: since I'm making my suggestions based on an assumption that the student will be very pressed for time, I'll regretfully say that these poetry recommendations might be omitted. Dr. Edward Vavra's Grammar for Elementary and Up, which is available for free. Wendi: Grammar is a subject you must begin where you are, so you could skip this and just continue what you are doing, or start using this or any other good resource wherever you need to start. Wendi: Likewise, poetry--you begin with where you are. The jury is still out, I think, on whether The Roar on the Other Side might be used entirely and this work omitted. See the shared files of this group for some lesson plans and links for the first half of this book and you can decide what you want to do with it. Apologia science materials by Dr. Jay Wile. Wendi: This is not foundational for further studies in the upper years, but it *was* a big favorite with the Advisory children. Wendi: This is a difficult book to get through, but it is a worthy book, very helpful. We do it as a read aloud and will continue to do so. I don't think you need to have read it before year 8, but I would start at the beginning and read through parts one and two during year 8, applying the ideas you read about to the books you are reading. Wendi: Well, chronologically, these chapters precede the later chapters, but they are short, easy enough reading, and you could simply start year 8 by reading the first four chapters in the first term. Wendi: Terrific book about the human body, pain, and the church family and how we support each other and what it means to be diseased or healthy in our interactions one with another. A good book to read, but not necessarily foundational to understanding year 8. Wendi: These are must reads, I think. Wendi: All of the above are very good reads, and should be added to the free reading of the upper years, but I don't think they are necessary for an understanding of year 8. They each speak to the themes of law, order, freedom, responsibility, duty, and liberty. Wendi: The remaining books might profitably be added to free reading throughout the upper years. I would probably read David Copperfield before I read the other Dickens books in the upper years, because it's semi-autobiographical, but it really doesn't make that much difference.